From left to right: Dr. Gordon Roesler of DARPA, Bretton Alexander of Blue Origin; Jason Dunn of Made in Space, Thierry Guillemin of Intelsat; David Lackner of SSL; Dorothy Rasco of NASA. Photo: Future Space Leaders Conference. [Via Satellite 07-18-2014] Satellite companies on the Future Space 2014 event panel “Return of Wicked Cool Space Technology,” wasted no time in their discussions of advanced satellite manufacturing and launch systems. Industry veterans Intelsat and SSL joined smaller companies Made in Space and the normally quiet Blue Origin to talk technologies such as in-orbit servicing, reusable rockets and advanced satellite systems. Intelsat’s Chief Technology Officer Thierry Guillemin, said the company has strong incentives to use in-orbit servicing for its constellation of more than 50 satellites. Currently DARPA, the German Space Agency (DLR), ViviSat and MDA are all pursuing various in orbit servicing projects. 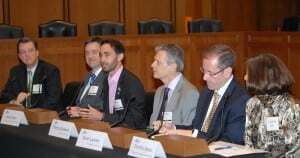 “There are several projects — service projects — that are in the state of being put together and, as the largest commercial [satellite] operator in the world, we are poised to be probably one of the first users of these systems because there are so many different ways for us to use in-orbit servicing,” said Guillemin. Asia Broadcast Satellite (ABS) CEO Tom Choi has also expressed interest in using in-orbit servicing for satellite life extension, commenting at the SATELLITE 2014 Conference and Exhibition that such services would be preferable to de-orbiting some of the company’s spacecraft at the end of their lifetime. Guillemin’s bigger interest however, was in software-defined payloads for satellites. Geostationary satellites typically have a 15-year lifespan, during which other less-static technologies can advance more rapidly. Intelsat’s dream, according to Guillemin, is for satellites to keep up with on the ground developments while in orbit. This would require a major change in the way satellites are manufactured. “I don’t want to have to wait for my order to build my spacecraft. I want [satellite manufacturers] to build a product line of satellites that are off the shelf; I buy one that I want, I launch it right away, and once it’s in orbit, by software, I define the mission … if they can do that, the cost of our spacecraft will drop dramatically because we would be able to buy 20 [to] 50 times the same thing,” he said. Sitting adjacent, Intelsat’s long time partner SSL casually replied: “we’re working on it.” David Lackner, VP of business development at SSL, highlighted the company’s work with NASA’s Laser Communications Relay Demonstration (LCRD) scheduled for 2017, and the recently awarded Air Force contract for the Hosted Payload Solutions (HoPS) program. Lackner said SSL is keen to work with commercial space startups, similar to Skybox Imaging for which SSL is building a fleet of Earth-imaging satellites. Made in Space CEO Jason Dunn, whose company focuses on building satellites and other structures — you guessed it — in space, pointed to 3-D printing as the way to accelerate industry productivity. The company has a NASA-certified 3-D printer designed for use on the International Space Station (ISS). The printer completed all the agency’s milestones ahead of schedule, which pushed the launch up to the SpaceX Commercial Resupply mission CRS 4 in August 2014. “[Launching] really is the bottleneck, and if we didn’t have to launch everything from the surface of the planet, maybe we would be further along than we are in space,” said Dunn. said satellite launches are also part of the plan. “It’s about human spaceflight, [but] we will be able to do payloads as well in the future to launch communications satellites,” he said. Blue Origin’s entrance into the launch market would be significant, as this could introduce a second reusable launch system into an increasingly crowded business. The company’s Vertical Takeoff, Vertical Landing (VTVL) launch vehicle, New Shepard, has been under development for several years and was once a top contender for human-rated ISS missions. Alexander said New Shepard will undergo tens of suborbital flights starting next year, followed by the testing of an orbital booster. Blue Origin’s propulsion of choice is liquid hydrogen, an attribute he said will contribute to the launcher’s competitiveness. “We chose hydrogen from an engine technology standpoint because it is the most efficient. It was also the hardest and we’ve proved that we can do that with a very small team at a price point that is probably a tenth of what traditional industry development programs have done,” he said. A new low-cost alternative would truly prove disruptive to the satellite industry as well as the larger spaceflight industry in general. Though normally Blue Origin keeps its cards close to its chest, Alexander said more updates regarding New Shepard would be coming soon.